Jake from Auroch Digital here! 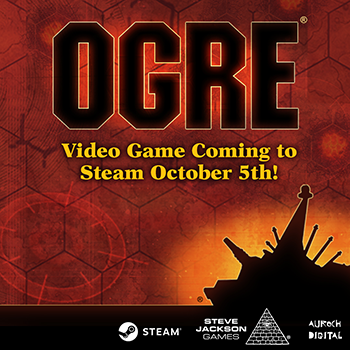 We're hard at work on our upcoming video game of Ogre, a digital adaptation of the classic tabletop warfare game from Steve Jackson Games. Things are coming along really well with the development of the game, and we've reached a point where we need your input: beta testing! In a beta test, we provide you with an unreleased version of the game to take out for a spin ­– try out the systems we've implemented, see what we've built ­– and then give us feedback. You might encounter the odd bug here or there, so we'll expect you to send us bug reports as well. It's an exciting opportunity to see a game before it's released, as well as providing meaningful criticism to help shape this very special digital adaptation of Ogre. Want to get involved? Fantastic. Please read the following instructions carefully . . . Which Ogre games (and related expansions) you've played. How long, in years, you've been playing Ogre. The last three video games you played. Which platforms (Mac, PlayStation 4, Android tablet, etc.) you currently own and regularly use for gaming. Which Ogre unit is your favorite (Mark IV, G.E.V.s, Infantry, etc.) and why. Send all of that information to us via our sign-up form by the closing date of September 6, at 5 p.m. UK time. We'll be in touch via email sometime after that date to let you know if you've been chosen. To participate in this beta, you must have Steam, on a Windows PC, running Windows 7 or later. Application to the beta does not guarantee that you will be accepted into the beta program, and we have the right to revoke access to it at any time, either on an individual or group basis. Access to the beta does not include access to the full game when it is released on Steam, so if you wish to continue playing after the beta ends, you'll need to purchase the game. The game is very much in development and you should be aware that going into the beta program is an active part of that development. We will expect testers to answer questions and send us information when requested. If you don't want to do those things, then this beta isn't for you. Applying for the beta will also automatically sign you up for the Auroch Digital newsletter. It's completely free and you can opt out at any time. Got all that? Ace! Any questions about joining the beta? Feel free to email me.